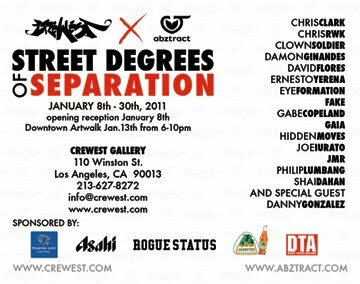 Please join us on Saturday, January 8th, 2011 for the opening reception of Street Degrees of Separation. Street Degrees of Separation is a group show with artists from around the world, coming together to kick off the new year. 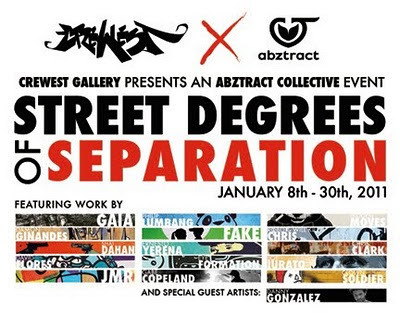 2011 will bring amazing new work, new projects and new art by some of today’s greatest street-artists, and while artists prepare for what they will unleash on walls across the planet, they found themselves coming together for this show. Street Degrees explores the global connection of street-artists and their unified motive in the new year: Reinvention. The show brings artists from Los Angeles, New York, Boston, Texas, UK, Sweden, Indonesia and much more. The artists list includes Chris Clark, Chris RWK, Clown Soldier, Damon Ginandes, David Flores, Ernesto Yerena, EyeFormation, FAKE, Gabe Copeland, GAIA, Hidden Moves, Joe Iurato, JMR, Philip Lumbang, Shai Dahan and special guest Danny Gonzales. Exhibition runs through Sunday, January 30, 2011. Artwalk event takes place on Thursday, January 13, 2011 from 6-10pm.